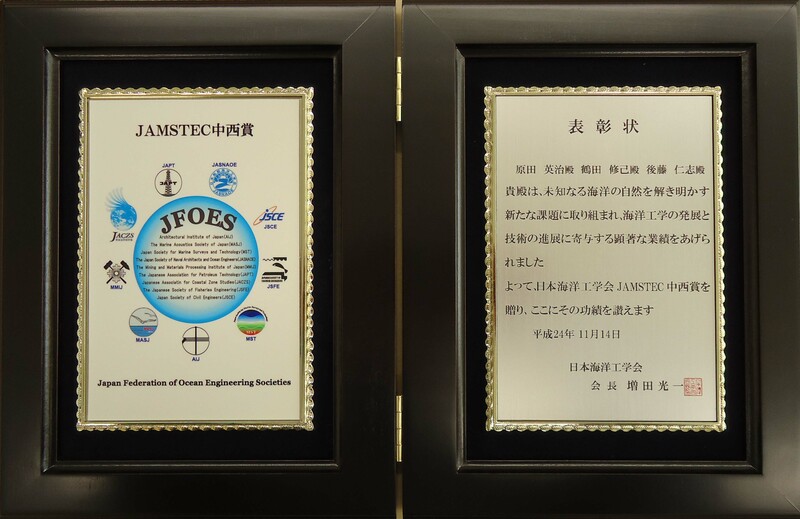 Shimizu, Y. and Gotoh, H.: Toward Enhancement of MPS Method for Ocean Engineering: Effect of Time-Integration Schemes, International Journal of Offshore and Polar Engineering, Vol. 26, No. 4, pp. 378–384, December 2016. Gotoh, H., Ikari, H., Memita, T. & Sakai, T. : Lagrangian Particle Method for Simulation of Wave Overtopping on a Vertical Seawall, Coastal Eng. Jour., Vol. 47, Nos. 2-3, pp.157-181, 2005. Gotoh, H., Shibahara, T. & Sakai, T.:Sub-Particle-Scale Turbulence Model for the MPS Method - Lagrangian Flow Model for Hydraulic Engineering -, Computational Fluid Dynamics Jour., Vol.9 No.4, pp.339-347, 2001. Gotoh, H. & Sakai, T.:Lagrangian simulation of breaking waves using particle method, Coastal Eng. Jour., Vol. 41, Nos. 3 & 4, pp.303-326, 1999. 後藤仁志・林　稔・目見田哲・酒井哲郎：粒子法による直立護岸前面砕波・越波の数値シミュレーション，土木学会論文集, 第726号/II-62, pp.87-98, 2003. 後藤仁志・林　稔・酒井哲郎：固液二相流型粒子法による大規模土砂崩壊に伴う水面波の発生過程の数値解析，土木学会論文集, 第719号/II-61, pp.31-45, 2002. Khayyer, A. & Gotoh, H.: Particle-Based Vs. Grid-Based Simulation of Plunging Breaking Waves: A Basic Study, Jour. Hydroscience and Hydraulic Engrg., JSCE, Vol.26, No.1, pp. 1-9, 2008. Gotoh, H., Ikari, H., Sakai, T. & Tanioka H.: Computational Dynamics of Stream in Underground Staircase by Three-Dimensional Particle Method, Jour. Hydroscience and Hydraulic Engrg., JSCE, Vol.25, No.2, pp. 13-22, 2007. Khayyer, A. & Gotoh, H.: Applicability of MPS Method to Breaking and Post-Breaking of Solitary Waves, Annual Jour. of Hydraulic Eng., JSCE, Vol. 51, pp.175-180, 2007. Shao, S. & Gotoh, H. :Pressure Analysis of Dam-Break and Wave-Breaking by SPH Model, Annual Jour. of Hydraulic Eng., JSCE, Vol. 47, pp.403-408, 2003. 後藤仁志・五十里洋行・村元茂則・安岡恒人・高橋和秀：大型越波排水路付護岸前面のブロック移動限界予測へのMPS 法の応用, 海岸工学論文集, 第54巻, pp.756-760, 2007. 後藤仁志・橋本麻末・酒井哲郎：落水CGの写実性のための粒子法SPS表情モデルの開発，土木学会論文集, 第782号/II-70, pp. 51-64, 2005. 後藤仁志・酒井哲郎・林　稔・織田晃治：MPS法による津波の堤越流・氾濫過程の数値シミュレーション，海岸工学論文集, 第48巻, pp.141-145, 2001. 後藤仁志・酒井哲郎・目見田　哲・沖　和哉・林　稔：粒子法による直立護岸前面の砕波・越波過程の数値解析，海岸工学論文集, 第46巻, pp.46-50, 1999. 後藤仁志・酒井哲郎・沖　和哉：粒子法による透水斜面上の砕波・遡上過程の数値シミュレーション，海洋開発論文集, 第15巻, pp.315-320, 1999. Gotoh, H., Sakai, T. & M. Hayashi: Lagrangian Model of Drift-Timbers Induced Flood by using Moving Particle Semi-Implicit Method, Jour. Hydroscience and Hydraulic Engrg., JSCE, Vol.20, No.1, pp. 95-102, 2002. 後藤仁志・五十里洋行・安岡恒人・奥　謙介：被覆ブロック移動予測のためのDEM-MPSハイブリッドモデルの提案，海岸工学論文集, 第55巻, pp.836-840, 2008. 後藤仁志・五十里洋行・酒井哲郎・奥　謙介：山地橋梁の流木閉塞過程の3 次元シミュレーション，水工学論文集, 第51巻, pp.835-840, 2007. 五十里洋行・後藤仁志・角　哲也：自然調節型洪水吐きの流木による閉塞機構に関する計算水理学的研究，水工学論文集, 第50巻, pp.793-798, 2006. 大谷英夫・後藤仁志・鷲見　崇・伊藤一教：ウォータージェットを用いた底泥下砂質土の揚砂メカニズムに関する研究，水工学論文集, 第48巻, pp.1189-1194, 2004. 後藤仁志・林　稔・安藤　怜・鷲見　崇・酒井哲郎：砂礫混合層を伴う混相流解析のためのDEM-MPS法マルチスケールリンクの開発，海岸工学論文集, 第50巻, pp.26-30, 2003. 後藤仁志・林　稔・安藤　怜・酒井哲郎：固液混相流解析のためのDEM-MPS法の構築，水工学論文集, 第47巻, pp.547-552, 2003. 後藤仁志・林　稔・酒井哲郎：固液二相流型粒子法による大規模土砂崩壊に伴う水面波の発生過程の数値解析，土木学会論文集, 第719号/II-61, pp.31-45 2002. 後藤仁志・林　稔・酒井哲郎・織田晃治・五十里洋行：遡上津波の戻り流れによる護岸法先洗掘のグリッドレス解析，海岸工学論文集, 第49巻, pp.46-50, 2002. 後藤仁志・林　稔・織田晃治・酒井哲郎：越流水による河川堤防侵食過程のグリッドレス解析，水工学論文集, 第46巻, pp.439-444, 2002. 後藤仁志・酒井哲郎・林　稔・八木哲生：MPS法による甌穴形成過程の数値解析，水工学論文集, 第46巻, pp.767-772, 2002. 後藤仁志・林　稔・安藤　怜・酒井哲郎：暗渠排水路の氾濫過程のLagrange解析，水工学論文集, 第46巻, pp.845-850, 2002. 後藤仁志・林　稔・酒井哲郎：固液二相流型MPS法による波・底泥相互干渉の数値解析，海岸工学論文集, 第48巻, pp.1-5, 2001. 後藤仁志・酒井哲郎・林　稔・安藤　怜：構造物下面への接岸浮遊物の潜込過程のLagrange型シミュレーション，海岸工学論文集, 第48巻, pp.816-820, 2001. 後藤仁志・酒井哲郎・林　稔：粒子法による流木群堰止め過程のLagrange解析，水工学論文集, 第45巻, pp.919-924, 2001. 後藤仁志・酒井哲郎・林　稔：大規模斜面崩壊による水面波の発生過程のグリッドレス解析，海岸工学論文集, 第47巻, pp.56-60, 2000. 後藤仁志・Jorgen Fredsoe：Lagrange型固液二相流モデルによる海洋投棄微細土砂の拡散過程の数値解析，海岸工学論文集, 第46巻, pp.986-990, 1999. Khayyer, A. & Gotoh, H.: Refined Simulation of Solitary Plunging Breaker by CMPS Method, Annual Jour. of Hydraulic Eng., JSCE, Vol. 52, pp.121-126, 2008. Khayyer Abbas・後藤仁志：粒子法における圧力擾乱低減のためのCMPS-HS法の提案，海岸工学論文集, 第55巻, pp.16-20, 2008. Gotoh, H., Shao, S. & Memita, T.: SPH-LES Model for Wave Dissipation using a Curtain Wall, Annual Jour. of Hydraulic Eng., JSCE, Vol. 47, pp.397-402, 2003. 後藤仁志・林　稔・織田晃治・酒井哲郎：SPS乱流モデル付き拡張MPS法による砕波過程の数値解析，海岸工学論文集, 第49巻, pp.31-35, 2002. 後藤仁志・五十里洋行・酒井哲郎・奥　謙介：浮体群を伴う津波氾濫流の3Dシミュレーション，海岸工学論文集, 第53巻, pp196-200, 2006. Gotoh, H., Tsujimoto, T. & Nakagawa, H.:Refined PSI-cell model for interphase and interparticle momentum transfer in bed-load layer, Jour. Hydroscience and Hydraulic Engrg., JSCE, Vol.13, No.1, pp. 13-24, 1995. 原田英治・後藤仁志：三次元数値移動床による混合粒径シートフロー漂砂の分級過程の解析，土木学会論文集B, Vol. 62, No.1, pp128-138, 2006. Gotoh, H., Tsujimoto, T. & Nakagawa, H.:Formula of sediment discharge in oscillation-current coexisting flow, Jour. Hydroscience and Hydraulic Engrg., JSCE, Vol.13, No.1, pp. 25-34, 1995. Gotoh, H., Tsujimoto, T. & Nakagawa, H.:Dislodgment process of sediment particle on bed at an unsteady flow, Jour. Hydroscience and Hydraulic Engrg., JSCE, Vol.11, No.1, pp.21-30, 1993. Gotoh, H., Tsujimoto, T. & Nakagawa, H.:Numerical simulation of bed-load transport in unsteady uniform flow, Jour. Hydroscience and Hydraulic Engrg., JSCE, Vol.11, No.1, pp.31-40, 1993. Nakagawa, H., Murakami, S. & Gotoh, H.: Structure of flow and dispersion process of suspended particle over two-dimensional dunes, Jour. Hydroscience and Hydraulic Engrg., JSCE, Vol.9, No.2, pp.17-26, 1992. Nakagawa, H., Tsujimoto, T., Murakami, S. & Gotoh, H.: Transition mechanism from saltation to suspension in bed-material-load transport, Jour. Hydroscience and Hydraulic Engrg., JSCE, Vol.8, No.1, pp.41-54, 1990. 酒井哲郎・後藤仁志・Abbas Yeganeh-Bakhtiary：シートフローへの遷移領域における砂粒子運動と流れ場の相互作用に関する基礎的実験，水工学論文集, 第41巻, pp.825-830, 1997. 原田英治・青木伸一・後藤仁志・細田　尚：水中投入粒子群挙動および誘起流動過程，海岸工学論文集, 第53巻, pp861-865, 2006. 原田英治・細田　尚・後藤仁志・永田祥久：固液混相流モデルによる高濃度掃流粒子層発達過程の数値解析，水工学論文集, 第49巻, pp.745-750, 2005. 原田英治・細田　尚・後藤仁志・Euler-Lagrangeカップリングモデルによる捨石堰の崩壊過程の計算力学的研究，土木学会論文集, 第775号/II-69, pp.45-54 2004. 後藤仁志・Yeganeh, A.・酒井哲郎：混相流モデルと個別要素法の融合による高濃度掃流層の数値解析，土木学会論文集, 第649号/II-51, pp.17-26, 2000. Gotoh, H. & Sakai, T.:Behavior of bed-material particles as a granular material in a bed-load transport process, Jour. Hydroscience and Hydraulic Engrg., JSCE, Vol.18, No.1, pp. 141-151, 2000. Yeganeh, A., Gotoh, H. & Sakai, T.:Numerical study of particle diameter effect on oscillatory sheet flow transport with movable bed simulator, Annual Jour. of Hydraulic Eng., JSCE, Vol. 44, pp.653-658, 2000. Gotoh, H. & Sakai, T.:Accelerating Process of Surface-Sheared-Sand Layer, Jour. Hydroscience and Hydraulic Engrg., JSCE, Vol.16, No.1, pp. 109-115, 1998. Gotoh, H., Tsujimoto, T. & Nakagawa, H.: Discrete probabilistic model of bed-load layer as granular assembles, Jour. Hydroscience and Hydraulic Engrg., JSCE, Vol.14, No.1, pp. 13-23, 1996. 後藤仁志・鷲見　崇・酒井哲郎：個別要素法への陰解法の導入による数値移動床の改良，土木学会論文集B, Vol. 62, No.2, pp201-209, 2006. 後藤仁志・原田英治・酒井哲郎：個別要素法によるrolling grain rippleの発生過程の数値シミュレーション，海岸工学論文集, 第47巻, pp.481-485, 2000. 原田英治・Yeganeh, A・後藤仁志・酒井哲郎：粒状体モデルによるシートフロー漂砂の分級過程の数値シミュレーション，海岸工学論文集, 第47巻, pp.491-495, 2000. 酒井哲郎・後藤仁志・沖　和哉・高橋智洋：混合粒径シートフロー漂砂の鉛直分級過程の可視化実験，海岸工学論文集, 第46巻, pp.516-520, 1999. 後藤仁志・酒井哲郎：移動床におけるsaltation 粒子の反発機構に関する基礎的実験，水工学論文集, 第42巻, pp.1050-1056, 1998. 原田英治・後藤仁志・酒井哲郎・合田健一：3D-DEM による消波ブロック群の沈下過程の数値シミュレーション，海岸工学論文集, 第54巻, pp.921-925, 2007. 後藤仁志・原田英治・高橋秀文・山口一哉・丸山由太・高橋和秀・森　貴之：防潮堤改修に伴う津波来襲時の砂浜からの群集避難プロセスの改善評価，海岸工学論文集, 第55巻, pp.1366-1370, 2008. 酒井哲郎・後藤仁志・原田英治・許　伶宅・岩本晃幸：人工海浜砂層内空洞の形成過程に及ぼす埋設物の影響，海岸工学論文集, 第51巻, pp.806-810, 2004. 原田英治・後藤仁志・酒井哲郎・鄭　知博：波浪による護岸隣接砂層内の空洞成長過程の3Dシミュレーション，海岸工学論文集, 第50巻, pp.891-895, 2003. 酒井哲郎・間瀬　肇・後藤仁志・中西　隆：透水層の位置と長さが間隙水浸出流速に及ぼす影響，海岸工学論文集, 第44巻, pp.676-680, 1997. 酒井哲郎・後藤仁志・沖　和哉・中村隆志：砂浜生物のハビタートシミュレーション，海岸工学論文集, 第44巻, pp.696-700, 1997. 酒井哲郎・後藤仁志・森川　淳・川崎順二：高波圧を受ける海底地盤内間隙水圧の分布特性，海岸工学論文集, 第42巻, pp.1021-1025, 1995. 酒井哲郎・後藤仁志・森川　淳：海底面における排水条件の非一様性が地盤内間隙水圧分布に与える影響，海岸工学論文集, 第41巻, pp.911-915, 1994. 間瀬　肇・坂本雅信・酒井哲郎・後藤仁志：ニューラルネットワークを用いた捨石防波堤の安定性評価，海岸工学論文集, 第41巻, pp.761-765, 1994. 酒井哲郎・後藤仁志・森川　淳・柏村真直：	海底面の水圧変動に対する地盤内間隙水圧の応答特性に関する基礎的実験，水工学論文集, 第38巻, pp.511-516,1994. 後藤仁志・間瀬　肇・坂本雅信：ニューラルネットワークを用いた護岸被災形態の類型化，水工学論文集, 第38巻, pp.833-836, 1994. （編著） Computational Wave Dynamics, World Scientific Publishing Co., 234pp, 2013. 後藤仁志：流水表情の数値シミュレーション-親水都市デザインのためのアメニティー水理学，日本流体力学会誌「ながれ」 / 特集『ながれの表情とアメニティー』，Vol.23, No.2, pp.79-86,2004. 後藤仁志：水域環境評価への固液混相流モデルの貢献，混相流 / 特集『モノづくりと混相流(8)』，Vol.20, No.4, pp.328-335,2006. 後藤仁志：流砂・漂砂の流動モデルにおける「粒子」的視点，日本流体力学会誌「ながれ」 / 特集『流れと粒子』，Vol.21, No.3, pp.240-249,2002. 後藤仁志：Lagrange型砂粒子運動モデルに基づく数値流砂力学の展開，混相流 / 特集『多自然型河川と混相流』，Vol.13, No.1, pp.42-51,1999. 後藤仁志：都市水害における群衆避難のシミュレーション，計算工学/特集『安全・安心のための計算工学』，Vol.12, No. 2, pp.23-26, 2007. Goth, H.：Accurate particle method for computational sediment dynamics, Keynote Lecture, The 3rd symposium on two‐phase modelling for sediment dynamics in geophysical flows THESIS), 2016.9. Goth, H.：Improved Particle Methods for Violent Free-Surface Flow Computation, Keynote Lecture, 3rd International Conference on Violent Flows VF-2016，2016.3. Goth, H.：Numerical Wave Flume for Simulating Flows with Violent Free-Surface Motion, The 11th International Workshop on Coastal Disaster Prevention（合田良實先生追悼ワークショップ）,2013.4. Gotoh, H.: Lagrangian Particle Method - Advanced Technology for Numerical Wave Flume, Invited Lecture on Plenary Session of Hydrodynamics, ISOPE-2009, Osaka, Japan, 2009. Gotoh, H.: Simulation of Wave Overtopping on Stepped Seawall with Drainage by the MPS Method, Violent Flows-2007, Fukuoka, Japan, 2007. Gotoh, H.: Contribution of the Particle Method in Hydro-Science and Engineering，九州大学応用力学研究所国際研究集会移動境界および界面の流れ解析」，九州大学，2005. Yoshifuji, N., Gotoh, H. and Ikari, H.: Numerical Analysis on Deformation of Wave Dissipating Blocks by GPU-Accelerated DEM Computation, Proc. International Session in Conf. of Coast Eng., Vol.3, JSCE, pp. 16-20, 2012. Khayyer, A., Gotoh, H. & Ikari, H.: Development of a Novel 3D Higher Order Laplacian Model for Enhanced Prediction of Wave Impact Pressure Calculation in 3D MPS-Based Simulations, Proc. International Session in Conf. of Coast Eng., Vol.3, JSCE, pp. 11-15, 2012. Gotoh, H., Khayyer, A., Ikari, H. & Tsuruta, N.: An Improved 3D Particle Method for Violent Wave Impact Calculations, Proc. 2nd International Conference on Violent Flows, Nantes France, pp.188-193, 2012. Khayyer, A., Gotoh, H., Ikari, H. & Tsuruta, N.: An Enhanced Particle Method for Simulation of Violent Multiphase Flows, Proc. 2nd International Conference on Violent Flows, Nantes France, pp.51-57, 2012. Gotoh, H. & Khayyer, A.: An Improved Consistent 3D Particle Method for Enhanced Wave Impact Calculations, Proc. the 7th International SPHERIC Workshop, Prato, Italy, pp.375-380, 2012. Khayyer, A. & Gotoh, H.: A Consistent Particle Method for Simulation of Multiphase Flows with High Density Ratios, Proc. the 7th International SPHERIC Workshop, Prato, Italy, pp.340-346, 2012. Khayyer, A., Gotoh, H. & Ikari, H.: Refined Simulations of Violent Sloshing Flows by an Enhanced Particle Method, Proc. International Session in Conf. of Coast Eng., Vol.2, JSCE, pp. 6-10, 2011. Khayyer, A. & Gotoh, H.: Refined Wave Impact Pressure Calculations by An Enhanced Particle Method, Proc. Coastal Structures 2011, Yokohama, on CD-ROM, 2011. Ikari, H., Gotoh, H. & Khayyer, A.: Numerical simulation on moored floating body in wave by improved MPS method, Proc. Coastal Structures 2011, Yokohama, on CD-ROM, 2011. Hori, C., Gotoh, H., Khayyer, A. & Ikari, H.: Simulation of flip-through wave impact by cmps method with sps-turbulence model, Proc. Coastal Structures 2011, Yokohama, on CD-ROM, 2011. Khayyer, A., Gotoh, H., Ikari, H. and Hori, C.: Development of 3D Parallelized CMPS-HS with a Dynamic Domain Decomposition Approach, Proc. International Session in Conf. of Coast Eng., Vol.1, JSCE, pp. 6-10, 2010. Gotoh, H., Ikari, H. and Yoshifuji, N.: 3D Numerical Wave Flume with Interactive Pre-and Post-Processors, Proc. International Session in Conf. of Coast Eng., Vol.1, JSCE, pp. 71-75, 2010. Gotoh, H., Ikari, H., Khayyer, A. and Hori, C.: 3D-CMPS Method for Enhanced Simulation of a Plunging Breaker and Resultant Splash-up, Proc. APAC, 2009, Singapore, paper on CD-ROM, 2009. Ikari, H., Gotoh, H., Tonomo, K. and Mizoe, A.: Numerical Simulation of Drifting Container on Apron due to Tsunami by 3D MPS Method, Proc. APAC, 2009, Singapore, paper on CD-ROM, 2009. Khayyer, A. and Gotoh, H.: Improved MPS methods for wave impact calculations, Proc. Coastal Dynamics, Tokyo, Japan, Paper No. 4 pp.1-14, 2009. Gotoh, H., Khayyer, A., Ikari, H. and Hori, C.: 3D-CMPS method for improvement of water-surface tracking in breaking waves, Proc. Coastal Dynamics, Tokyo, Japan, Paper No. 5 pp.1-11, 2009. 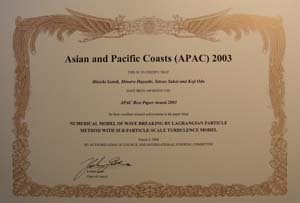 Ikari, H. and Gotoh, H.: Interaction model of moored buoy and breaking wave based on Lagrangian particle method, Proc. Coastal Dynamics, Tokyo, Japan, Paper No. 17 pp.1-10, 2009. Gotoh, H., Khayyer, A. and Ikari, H.: Simulation of SPHERIC Benchmark Test 2, “3D schematic dam break and evolution of the free surface”, by an improved parallelized particle method and SPHYSICS, Proc. 4th SPHERIC Workshop, Nantes, France, pp.265-272, 2009. Khayyer, A., Gotoh, H., and Shao, S.: An Improved Incompressible SPH Method for Wave Impact Simulations, Proc. 4th SPHERIC Workshop, Nantes, France, pp.286-293, 2009. Gotoh, H.: Lagrangian Particle Method - Advanced Technology for Numerical Wave Flume, Invited Lecture on Plenary Session of Hydrodynamics, Proc. ISOPE-2009, Osaka, Japan, pp. 333-339, 2009. Khayyer, A. and Gotoh, H.: Wave Impact Calculations by Improved SPH Methods, Proc. ISOPE-2009, Osaka, Japan, pp. 340-347, 2009. Gotoh, H., Ikari, H. & Yasuoka, T.: Simulation of Armor Blocks in front of Caisson Breakwater by DEM-MPS Hybrid Model, Proc. ISOPE-2009, Osaka, Japan, pp. 365-370, 2009. Ikari, H. and Gotoh, H.: Lagrangian Particle Method for Tracking of Buoy Moored by Chain, Proc. ISOPE-2009, Osaka, Japan, pp. 371-375, 2009. Gotoh, H., Khayyer, A., Ikari, H. and Hori, C.: Refined Reproduction of a Plunging Breaking Wave and Resultant Splash-up by 3D-CMPS Method, Proc. ISOPE-2009, Osaka, Japan, pp. 518-524, 2009. Khayyer, A., Gotoh, H., and Shao, S.: Corrected SPH for Incompressible fluid for accurate water-surface tracking in plunging breaker, Proc. ICCE, Hamburg, Germany, pp.132-143, 2008. Gotoh, H., Ikari, H., Yasuoka, T., Muramoto, S. and Takahashi, K.: Particle method for simulating wave overtopping on stepped seawall with drainage, Proc. ICCE, Hamburg, Germany, pp.3071-3083, 2008. Ikari, H. and Gotoh, H.: Parallelization of MPS Method for 3-D Wave Analysis, Advances in Hydro-Science and -Engineering, Vol. IV - Proc. 8th ICHE, Nagoya Japan, paper on CD-ROM, 2008. Gotoh, H. & Khayyer, A.: Improved MPS Methods for Refined Simulation of Free-Surface Hydrodynamic Flows, Advances in Hydro-Science and -Engineering, Vol. IV - Proc. 8th ICHE, Nagoya Japan, paper on CD-ROM, 2008. Khayyer, A., Gotoh, H. & S. Shao: Corrected Incompressible SPH for Accurate Water-Surface -Tracking in Plunging Breaking Waves, Proc. APCOM’07 in conjunction with EPMESC XI, Kyoto, Japan, on CD, 2007. Gotoh, H. & Ikari, H.: Numerical Analysis on Girder Bridge Washed Away by Tsunami Run-up, Proc. Violent Flows-2007, Fukuoka, Japan, pp.159-164, 2007. Gotoh, H., Ikari, H., Muramoto, S. & Yasuoka, T.:Simulation of Wave Overtopping on Stepped Seawall with Drainage by the MPS Method, Proc. Violent Flows-2007, Fukuoka, Japan, pp.11-16, 2007. Gotoh, H., Khayyer, A. & S. Shao: Corrected Incompressible SPH Model for the Simulation of Wave Breaking and Post-Breaking, Proc. Violent Flows-2007, Fukuoka, Japan, pp.47-53, 2007. Ikari, H., Gotoh, H. & Sakai, T.: Simulation of Wave Run-up by Liquid-Gas Two-Phase-Flow MPS Method, Proc. APAC2005, on CD, 2005. Gotoh, H., Ikari, H. & Sakai, T.: Simulation of Plunging Breaker by 3D MPS Method, Proc. APAC2005, on CD, 2005. Sakai, T., Gotoh, H., & Ikari, H.: Wave-Breaking Graphics by MPS Method with Sub-Particle-Scale Texture Model, Proc. Waves2005, Madrid, Spain, paper on CD-ROM, 2005. Ikari, H., Gotoh, H. & Sakai, T.: Liquid-Gas Two-Phase-Flow MPS Method for Simulation of Wave Overtopping, Proc. Waves2005, Madrid, Spain, paper on CD-ROM, 2005. Gotoh, H., Ikari, H. & Sakai, T.: Development of Numerical Wave Flume by 3D MPS Method, Proc. Waves2005, Madrid, Spain, paper on CD-ROM, 2005. Gotoh, H., Ikari, H. & Sakai, T. : Numerical Simulation of Stream over Staircase by 3D Particle Method, Proc MPMD-2005, Kyoto, Japan, pp. 185-190, 2005. Ikari, H., Gotoh, H., Hashinoto, M. & Sakai, T. : Refined Surface Tension Model for Lagrangian Simulation of Wave Breaking, Proc. ICCE, Lisboa, Portugal, pp.331-343, 2004. Gotoh, H., Hayashi, M. & Sakai, T.: Lagrangian Multiphase Flow Model for Debris-Flow-Induced Tsunami, Proc. ICCE, Lisboa, Portugal, pp.1121-1133, 2004. Gotoh, H., Sumi, T. & Sakai, T.: Preprocessor for Human Interface of Numerical Wave Flume, Advances in Hydro-Science and -Engineering, Vol. VI - Proc. 6th ICHE, Brisbane, Australia, paper on CD-ROM, 2004. Gotoh, H., Ikari, H. & Sakai, T.: Simulation of Falling Water by Lagrangian Particle Method, Advances in Hydro-Science and -Engineering, Vol. VI - Proc. 6th ICHE, Brisbane, Australia, paper on CD-ROM, 2004. Gotoh, H., Hashinoto, M., Ikari, H. & Sakai, T.: Development of Particle System as Postprocessor of Lagrangian Particle Method, Advances in Hydro-Science and -Engineering, Vol. VI - Proc. 6th ICHE, Brisbane, Australia, paper on CD-ROM, 2004. Gotoh, H., Hayashi, M. & Sakai, T.: Refined Solid-Phase Model in Lagrangian Particle Method for Solid-Liquid Two-Phase-Flow, Advances in Hydro-Science and -Engineering, Vol. VI - Proc. 6th ICHE, Brisbane, Australia, paper on CD-ROM, 2004. Shao, S., Gotoh, H. & Memita, T.: Simulation of Wave Overtopping on Partially Immersed Breakwater by SPH Model, Proc. APAC, 2003, Makuhari-Japan, paper on CD-ROM, 2003. M. Hayashi, Gotoh, H., Sakai, T. & Ikari, H.: Lagrangian Gridless Model of Toe Scouring of Seawall due to Tsumani Return Flow, Proc. APAC, 2003, Makuhari-Japan, paper on CD-ROM, 2003. Gotoh, H., M. Hayashi, Sakai, T. & Oda, K.: Numerical Model of Wave Breaking by Lagrangian Particle Method with Sub-Particle-Scale Turbulence Model, Proc. APAC, 2003, Makuhari-Japan, paper on CD-ROM, 2003. Gotoh, H., M. Hayashi & T. Sakai: Simulation of Tsunami-Induced Flood in Hinterland of Seawall by Using Particle Method, Proc. ICCE, Cardiff, UK, pp.1155-1167, 2002. Gotoh, H., Sakai, T., & M. Hayashi: Lagrangian Gridless Model for Structure-Fow-Floats Triangular Interaction, Proc. 13th IAHR-APD Cong., Singapore, Vol. 1, pp. 327-332, 2002. Gotoh, H., Sakai, T. & M. Hayashi & Andoh, S.:Lagrangian Solid-Liquid Two-Phase Fow Model for Wave-Seabed Interaction, Proc. 13th IAHR-APD Cong., Singapore, Vol. 2, pp. 765-770, 2002. Gotoh, H., Sakai, T. & M. Hayashi: Lagrangian Two-Phase Flow Model for the Wave Generation Process due to Large-Scale Landslides, Proc. APCE 2001, Dalian, China, pp. 176-185, 2001. Gotoh, H. & Fredsoe, J.: Lagrangian Two-Phase Flow Model of the Settling Behavior of Fine Sediment Dumped into Water, Proc. ICCE, Sydny, Australia, pp.3906-3919, 2000. Hayashi, M., Gotoh, H., Memita, T. & Sakai, T.: Gridless Numerical Analysis of Wave Breaking and Overtopping at Upright Seawall, Proc. ICCE, Sydny, Australia, pp.2100-2113, 2000. 林　稔・後藤仁志・酒井哲郎：固定壁粒子配列に起因する数密度不均質性の改善，計算工学講演会論文集, Vol. 6, pp. 505-508, 2001. 後藤仁志：MPS法の河川・海岸工学的諸問題への適用の試み，計算工学講演会論文集, Vol. 5, pp. 261-264, 2000. Harada, E., Gotoh, H. & Tsuruta, N.: Large eddy simulation for settling block using Euler-Lagrange coupling approach, Proc. Coastal Structures 2011, Yokohama, on CD-ROM, 2011. Harada, E. and Gotoh, H.: Highly Precise Simulation of Sedimentation Process of Rubble Mound by Multi-Phase Flow Model with LES, Proc. APAC, 2009, Singapore, paper on CD-ROM, 2009. Harada, E. and Gotoh, H.: Numerical simulation for vertical sorting of granular particles in sheetflow by two-phase turbulent flow model, Proc. Coastal Dynamics, Tokyo, Japan, Paper No. 90 pp.1-10, 2009. Harada, E., Gotoh, H. and Tsuruta, N.: A sediment process of a group of blocks by DNS, Proc. Coastal Dynamics, Tokyo, Japan, Paper No. 92 pp.1-11, 2009. Harada, E. and Gotoh, H.: Large eddy simulation of particle-laden flow by using solid/liquid two-phase flow model, Proc. ISOPE-2009, Osaka, Japan, pp. 453-457, 2009. Sakai, T., Harada, E. and Gotoh, H.: 3D Lagrangian simulation of compaction process of wave dissipating blocks due to high waves, Proc. ICCE, Hamburg, Germany,pp.3412-3422, 2008. Hajivalie, F., Yeganeh, A. and Gotoh, H.: Two-Phase Flow Simulation on Local Scouring in front of a Vertical Breakwater under Tidal Currents, Advances in Hydro-Science and -Engineering, Vol. IV - Proc. 8th ICHE, Nagoya Japan, paper on CD-ROM, 2008. Harada, E. and Gotoh, H.: A Compaction Process of Wave Dissipating Blocks due to High Waves Simulated by 3D Lagrangian Model, Advances in Hydro-Science and -Engineering, Vol. IV - Proc. 8th ICHE, Nagoya Japan, paper on CD-ROM, 2008. Harada, E., Gotoh, H. & Sakai, T.:3D Lagrangian Simulation of Compaction Process of Wave-Dissipating Blocks due to High Waves, Proc. Violent Flows-2007, Fukuoka, Japan, pp.221-226, 2007. Harada, E., Hosoda, T. & Gotoh, H.: Numerical Simulation of the Covering a House by a Debris Fow, Proc. of the 3rd International Conference on Fluival Hydraulics, Portugal Lisbon, pp.1401-1406 on CD-ROM, (ISBN 0-415-40815-6), 2006. Harada, E. & Gotoh, H.: Influence of Sand Shape to Vertical Sorting under Uniform Fow Condition, Proc. of the 3rd International Conference on Fluival Hydraulics, Portugal Lisbon, pp.853-858 on CD-ROM, (ISBN 0-415-40815-6), 2006. Harada, E., Hosoda, T. & Gotoh, H.: Examination of Landside Mechanism due to Liquefaction, ISFCD2005, Kyoto, Japan, on CD, 2005. Harada, E., Gotoh, H. & Sakai, T.: Particle-System Simulation of Pipelines Floatation due to Seabed Liquefaction, Proc. APAC2005, on CD, 2005. Harada, E., Gotoh H. & Sakai, T.: Simulation of Formation Process of Debris Fan by 3D Granular Material Model, Advances in Hydro-Science and -Engineering, Vol. VI - Proc. 6th ICHE, Brisbane, Australia, paper on CD-ROM, 2004. Harada, E., Hosoda, T. & Gotoh H.: Numerical Simulation for Destruction Process of Rubble Stones Dam, River Flow 2004, Napol,Italy, pp. 877-884, 2004. Harada, E., Hosoda, T., Gotoh H. & Obayashi K.: Numerical Simulation of Local Scouring Process by Solid-Liquid Two-Phase Flow Model, ISEH&IAHR-APD, Hong Kong, pp. 1851-1857, 2004. Harada, E., Gotoh, H., Sakai, T. & Ohno, M.: Numerical Simulation of Deformation Process of Wave-Dissipating Blocks by 3D-DEM, Proc. APAC, 2003, Makuhari-Japan, paper on CD-ROM, 2003. Sakai, T., Gotoh, H., Harada, E. & Imoto, Y.: Subsidence of Rubble Stones due to Wave-Induced Seabed Liquefaction, Proc. APAC, 2003, Makuhari-Japan, paper on CD-ROM, 2003. Sakai T., Gotoh, H., Harada E. & A. Yeganeh-Bakhtiary: Unsteadiness of Armoring in Oscillatory Sheetflow of Graded-Sediment, Proc. ICCE, Cardiff, UK, pp.2968-2980, 2002. Harada, E., Gotoh, H. & Sakai, T.: Block/Block Interaction Model for Predicting Catastrophic Destruction of Armor Blocks, Proc. 13th IAHR-APD Cong., Singapore, Vol. 2, pp. 789-794, 2002. Sakai, T., Gotoh, H., Harada, E., Takahashi, T. & Y. Hama: Unsteady Armoring in Graded-Sediment Sheetflow under Oscillatory Flow, Proc. APCE 2001, Dalian, China, pp. 766-775, 2001. Yeganeh-Bakthiary, A., Harada, E., Gotoh, H. & Sakai, T.: Reverse Grading Process of Sheet-Fow Sediment Transport with Granular Material Model, 2nd IAHR Symp. on River, Coastal and Estuarine Morphodynamics, Obihiro, Japan, pp.131-140, 2001. Harada, E., Gotoh, H. & Sakai, T.: Granular-Material-Model Combined Two-Phase Fow Simulation for Wind-Blown Sand Layer, 2nd IAHR Symp. on River, Coastal and Estuarine Morphodynamics, Obihiro, Japan, pp.121-130, 2001. Gotoh, H., Harada, E. & Sakai, T.: Role of Interparticle Collision on Instability of Sand Bed, 2nd IAHR Symp. on River, Coastal and Estuarine Morphodynamics, Obihiro, Japan, pp.111-120, 2001. Sakai, T., Gotoh, H., Oki, K. & Takahashi, T.: Vertical Grading of Mixed-Size Grains in Sheetflow Regime under Oscillatory Flow, Proc. ICCE, Sydny, Australia, pp.2766-2779, 2000. Yeganeh-Bakhtiary, A., Harada, E., Gotoh, H. & Sakai, T.: Aerodynamic Granular-Material Model of Wind-Blown Sand Layer, Proc. ICCE, Sydny, Australia, pp.2575-2588, 2000. Yeganeh, A., Gotoh, H. & Sakai, T.:Numerical Modelling of Sheet-Flow Transport under Wave and Current, Proc. of Inter. Conf. on Hydroscience and Engineering, Seoul, paper on CD-ROM, 2000. Gotoh, H. & Sakai, T.:Numerical Simulation of Granular Assembles Flowing on a Slope, Proc. XXVII th IAHR Conf., SanFrancisco, USA, Vol. 2, pp.1298-1303, 1997. Sakai, T. & Gotoh, H.: Effect of Wave-Induced-Pressure on Seabed Configulation, Proc. ICCE, Florida, USA, pp.3155-3168, 1996. Sakai, T. & Gotoh, H.: Numerical Simulation of Sediment Transport in Sheetflow Regime, Proc. IAHR Congress, London, UK, Vol. 3, pp. 299-304, 1995 . Gotoh, H., Tsujimoto, T. & Nakagawa, H.: Two-Phase-Flow Model of Open-Channel Flow with Saltating Particles, Proc. IAHR Congress, London, UK, Vol. 2, pp. 243-248, 1995 . Tsujimoto, T., Gotoh, H. & Nakagawa, H.: Open-Channel-Flow with Suspended Sediment Particles, Proc. IAHR Congress, London, UK, Vol. 2, pp. 232-237, 1995 . Tsujimoto, T., Gotoh, H. & Nakagawa, H.: Momentum Exchange between Fluid and Particles and Mutual Collisions among Particles in Saltation Layer , Proc. ICMF, Kyoto, Japan, pp.PT4- 33-40, 1995. Gotoh, H., Tsujimoto, T. & Nakagawa, H.: Numerical Simulation of Open-Channel Flow with Suspended Sediment as Solid/Liquid Two Phese Flow, Proc. ICMF, Kyoto, Japan, pp.EN- 3-10, 1995. Gotoh, H., Tsujimoto, T. & Nakagawa, H.: Dynamic Responce of Suspended Particles to Spectral Characteristics of Turbulence and Stochastic Simulation of Suspension, Proc. ICHE, Beijing, pp.2077-2084, 1995. Gotoh, H., Tsujimoto, T. & Nakagawa, H.: Sediment-Cloud Based Model of Suspension over Ripple Bed due to Wave Action, Proc. ICCE, Kobe, Japan, pp.2013-2027, 1994. Gotoh, H., Tsujimoto, T. & Nakagawa, H.: Modeling of Interphase Momentum Transfer and Interparticle Collision in Bed-Load Layer, Proc. APD-IAHR, Singapore, pp.565-572,1994. Gotoh, H., Tsujimoto, T. & Nakagawa, H.: Numerical Model of Granular Medium for the Dynamics of Bed-Load Layer, Proc. IAHR Congress, Tokyo, Japan, B-1-4, pp.33-40, 1993. Nakagawa, H., Tsujimoto, T. & Gotoh, H.:Numerical Simulation of Bed-Load Layer as Two-Phase Fow, Proc. Int. Conf. on Hydro-Science &-Engrg., Washington D.C., USA, pp.638-645, 1993. Nakagawa, H., Tsujimoto, T. & Gotoh, H.: Stochastic Simulation of Bed-Load Transport under Oscillation-Current Coexisting Fow, Proc. 6th Int. Sym. on Stochastic Hydraulics, Taipei, pp.197-204, 1992. 後藤仁志：移動床水理学における計算力学的アプローチ，第4回オーガナイズド混相流フォーラム講演論文集, OMF, 2000-Takayama, pp. 109-116, 2000. Abustan, S.M., Harada, E. & Gotoh, H.: Numerical Simulation for Evacuation Process against Tsunami Disaster at Teluk Batik in Malaysia by Multi-agent DEM Model, Proc. International Session in Conf. of Coast Eng., Vol.3, JSCE, pp. 56-60, 2012. Abustan, S.M., Harada, E. & Gotoh, H.: Numerical Simulation for Evacuation Process against Tsunami Disaster at Miami Beach in Penang, Malaysia, Proc. International Session in Conf. of Coast Eng., Vol.2, JSCE, pp. 31-35, 2011. Gotoh, H., Harada, E. and Ohniwa, K.: Contribution of the Evacuation Simulator for a Town Area Remodeling Plan for Protection against Disasters of Tsunami, Proc. APAC, 2009, Singapore, paper on CD-ROM, 2009. Gotoh, H., Harada, E. and Ohniwa, K.: Numerical simulation of coastal town planning against tsunami by DEM-base human behavior simulator, Proc. ISOPE-2009, Osaka, Japan, pp. 1248-1252, 2009. Gotoh, H., Harada, E., Maruyama, Y. and Takahashi, K.: Discrete Crowd Model for Simulation of Tsunami-Flood Refuge, Advances in Hydro-Science and -Engineering, Vol. IV - Proc. 8th ICHE, Nagoya Japan, paper on CD-ROM, 2008. Harada, E., Gotoh, H., Kubo, Y. & Sakai, T.: Particle-system Simulation of Crowd Behavior in Tsunami Flood Refuge, Proc MPMD-2005, Kyoto, Japan, pp. 329-334, 2005. Hur, Y. Harada, E., Gotoh, H. & Sakai, T.: Cave Formation Process in Artificial Sand Beach by 3D Movable Bed Simulator, Proc. APAC2005, on CD, 2005. Sakai, T., Gotoh, H. & Harada, E.: 3D Numerical Simulation of Cassion-Side Cave Formation in Artificial Sand Beach, Advances in Hydro-Science and -Engineering, Vol. VI - Proc. 6th ICHE, Brisbane, Australia, paper on CD-ROM, 2004. Gotoh, H. & Sakai, T.: Bivalve Habitat Based on Sediment-Transport Mechanics, Proc. ICCE, Florida, USA, pp.4300-4313, 1996. Gotoh, H. & Sakai, T.: Mechanics of Sediment Transport for Estimating Habitable Condition of Bivalves in Baech, Proc. Ecohydraulics 2000,Quebec City, Canada, Vol. A, 343-354, 1996. Sakai, T., Gotoh, H. & Yamamoto, T.: Block Subsidence under Pressure and Flow, Proc. ICCE, Kobe, Japan, pp.1541- 1552, 1994. 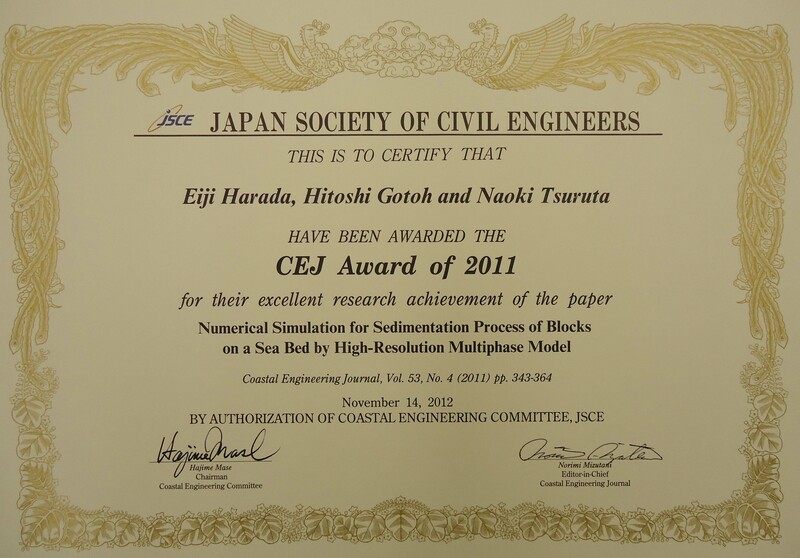 CEJ (Coastal Engineering Journal) Award of 2011, 2012. 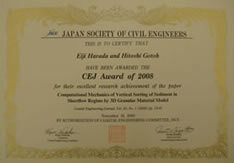 CEJ (Coastal Engineering Journal) Award of 2008, 2009. 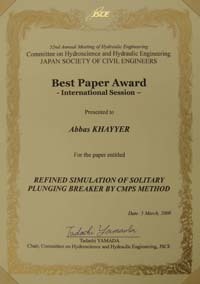 Best Paper Award of International Secessions in 52nd Annual Meeting of Hydraulic Engineering, Japan Society of Civil Engineers, 2008. 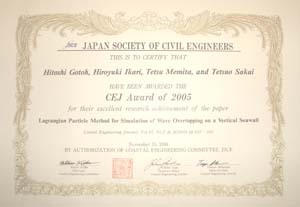 CEJ (Coastal Engineering Journal) Award of 2005, 2006. 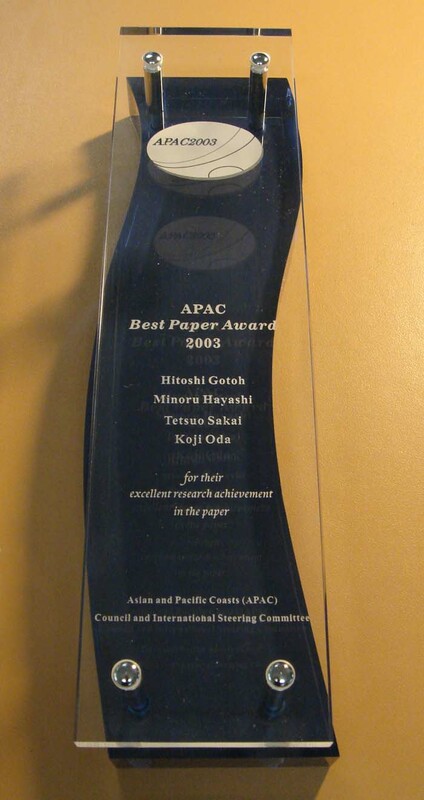 APAC Best Paper Award of 2003（最優秀論文賞）, 2004.